The current research on the biological basis of disease and syndrome meets many difficulties, such as using gene clip detection methods to analyze the differentially expressed genes (DEGs) will cost a lot and consuming much time if verified one by one, since there are a large number of DEGs. Applying data mining and literature mining methods to conduct disease-syndrome-related gene network has significant value in explaining the biological basis of disease and syndrome. Liver-fire hyperactivity syndrome is one of the most common syndromes of essential hypertension. Thus, this research conducts a preliminary study on the biological basis of hypertension and liver-fire hyperactivity from the genetic level. All the literatures were extracted from PubMed full-text database. All literatures related to hypertension were retrieved from PubMed database by GenCLip 2.0 online platform. Extract the top-100 genes related to essential hypertension to form hypertension closely related gene list. Extract keywords from the retrieved literature related to hypertension automatically, then check or delete keywords that are not related to or meaningless. Referring to the Chinese medicine clinical guidelines for hypertension of hyperactivity of liver-fire syndrome, add the corresponding names of the symptoms as keywords in traditional Chinese medicine (TCM) and Western medicine that is closely related to the liver-fire hyperactivity syndrome. Conduct clustering analysis of the top-100 genes related to essential hypertension based on the keywords. Apply GenCLip 2.0 to explore the related gene regulating signal molecules and construct the molecular network in hypertension with hyperactivity of liver-fire syndrome. Apply Functional Annotation Tool-DAVID Bioinformatics Resources 6.7, NIAID/NIH to conduct Kyoto encyclopedia of genes and genomes (KEGG)-pathway analysis. 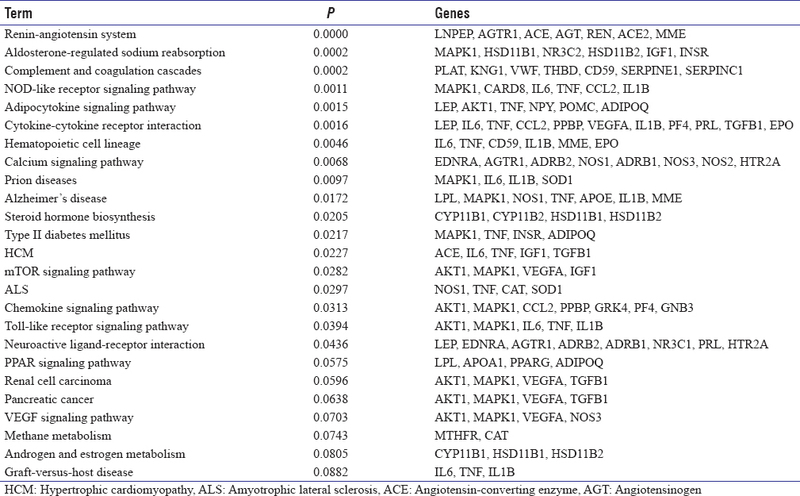 The top 100 genes of essential hypertension retrieved from GenCLip 2.0 online platform are as shown in [Table 1]. The clustering analysis results of essential hypertension-related genes are as follows [Figure 1]: clustered in the regulation of ambulatory blood pressure (circadian rhythm), regulation of rennin-angiotensin-aldosterone system (RAAS), and sympathetic nervous system activity, as well as endothelial dysfunction. 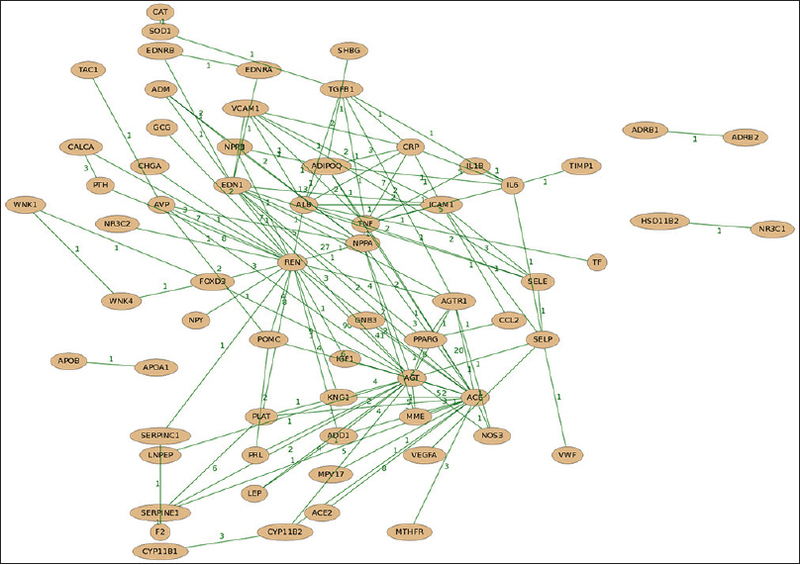 The gene co-occurrence network of essential hypertension is shown in [Figure 2] and [Figure 3]. The co-genes and co-cite numbers of essential hypertension related-genes are demonstrated in [Table 2]. 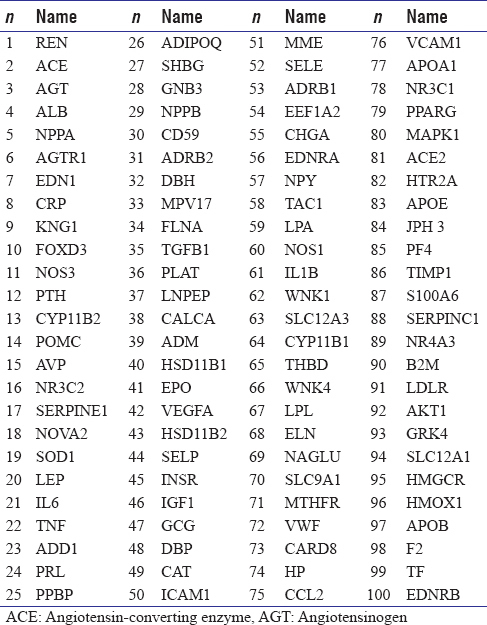 KEGG-pathway analysis of the closely related top 100 genes is shown in [Table 3]. The clustering results of the renin-angiotensin system, aldosterone-regulated sodium reabsorption, cytokine-cytokine-receptor interaction calcium signaling pathway, and Nucleotide binding oligomerization domain (NOD)-like receptor signaling pathway is shown in [Figure 4]. 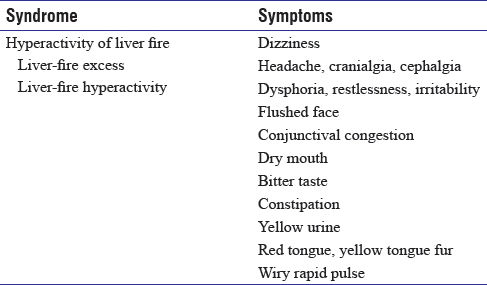 Referring to the Chinese medicine clinical guidelines for hypertension of hyperactivity of liver-fire syndrome, add the corresponding names of the symptoms as keywords in TCM and Western medicine that is closely related to the liver-fire hyperactivity syndrome [Table 4]. The study found that the symptoms of liver-fire hyperactivity, such as dry mouth closely related genes of RAAS pathway, Renin (REN), angiotensin-converting enzyme (ACE), angiotensinogen (AGT), and cytochrome P450 family CYP2D6 [Figure 5], which also provide clues from the genetic level to find the target in the treatment of hypertension with different syndromes of medicine. The biological basis of the syndrome has been the key point and difficulty in the study of TCM. Data mining methods, which are based on feature selection, are better fit for investigating the biological basis of TCM syndrome. The literature mining software GenCLip2.0, invented by Huang Zhongxi, associate professor of Southern Medical University, which can cluster the DEGs, as well as conduct special functional gene network. Inserting the disease-related gene into the software, it will not only show the name of the gene and ID but can also show all the literature relevant to the function of the genes annotation and the abstract of all the literature from Pub Med gene library. It is very convenient for the researcher to check the information. At the same time, researchers can add or combine keywords according to their own research to mining the relationship of the genes. Finally to obtain the signal pathway or network based on the genes to be analyzed and specified keywords. Since the software is updated in real time, so the relationship of genes and keywords mining by the software is also constantly updated. The genetic mechanism, network, and signal pathway are the latest. Zhu Wenhua used GenCLip2.0 online tools to mine literature related to DEGs. Finally, the gene ontology and path enrichment analysis of DEGS in the literature were carried out, and the molecular mechanism of the influence of intestinal flora on intestinal health was discussed. Liu Jing identified important modules in the network of potential molecular targets for coronary heart disease and analyzed the pivotal genes in the module through GenCLiP2.0 tools to identify important sub-pathways. The key genes and biological pathways of prostate epithelial cell response after low-dose cadmium exposure were identified by Liu Qiling bioinformatics analysis using Genclip and other software. Pub Med database is the most authoritative clinical medical literature database in the world, and it is also the most frequently used database for medical users to obtain foreign medical information. 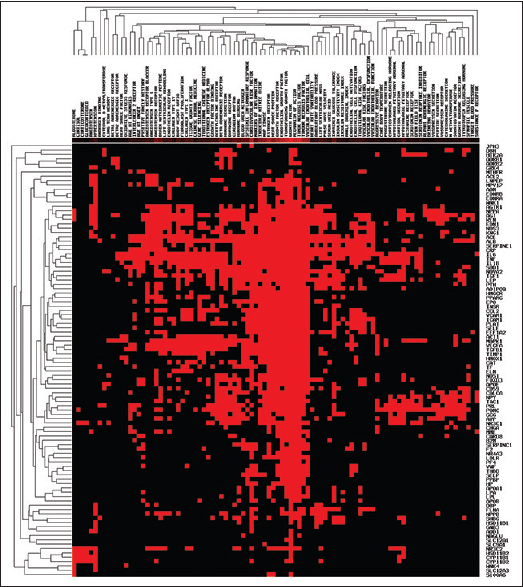 KEGG analyzes the genome and the depth information of functional gene, combined by intracellular biological processes and the existing computer information standardization of gene function, to analyze the gene function systematically. Combination of literature mining and data mining can construct the gene network of hypertension and the syndrome related genes, which provides a new method for the study of the biological basis of hypertension from the genetic level. The currently known candidate genes of essential hypertension involve in many functions, including the sympathetic nervous system, the RAAS, atrial natriuretic peptide, the kallikrein-kinin system, growth factors and hormones, cytoskeletal proteins and adhesion molecules, intracellular messenger, lipid metabolism, glucose metabolism, ion channel, or transporter. By applying Gen CLiP 2.0 gene mining software and KEGG-pathway analysis, this research clustered the function of the top 100 genes of Essential hypertension (EH), constructed a network of essential hypertension, and found that REN, ACE, AGT, tumor necrosis factor, transforming growth factor beta-1, and arginine vasopessin (AVP) genes were the most closely related genes. Clustering as circadian rhythm of blood pressure regulation and dynamic changes of blood pressure, hormone secretion, vasoactive substances and glucose tolerance, RAAS, sympathetic nervous system, and blood vessel endothelial function regulation pathway. In this study, hypertension with liver-fire hyperactivity syndrome was taken as an example to explore the correlation between syndromes and gene. The study found that dry mouth symptoms closely related genes of RAAS pathway key genes REN, ACE, AGT, and cytochrome P450 family CYP2D6, which also provide some clues from the genetic level to find the target in the treatment of hypertension of different syndromes of medicine. This study uses the existing scientific research results from the literature summary, preliminary study of molecular basis of disease and syndromes of hypertension from genes and signaling pathways, to provide a reference for clinical research on hypertension and TCM syndrome. However, due to the limitation of quantity and quality of TCM literature research in hypertension syndrome, further research combining with literature and the results of experimental and clinical need to be conducted to explain the biological basis of TCM syndrome. This study was supported by the National Natural Science Foundation of China (81503382), (81603499), (81473521), and the National Basic Research Program of China (973 Program) under Grant No. 2011CB505106, and scientific research project of Beijing University of Chinese Medicine (2015-JYB-JSMS036) and (2018-JYB-XJQ009). Qiu-Xia LI, Qiu-Jing WE, Ze-Tao LI. Using of GenCLip software in searching AS disease-related genes. New Med 2011;42:304-7. Li S. Exploring traditional Chinese medicine by a novel therapeutic concept of network target. Chin J Integr Med 2016;22:647-52. Luo JW, Lin CH, Zhu YB, Zheng XY, Wu YX, Chen WW, et al. Association of tongue bacterial flora and subtypes of liver-fire hyperactivity syndrome in hypertensive patients. Evid Based Complement Alternat Med 2018;2018:9536924. Youyu Z. Guidelines for the clinical research of chinese medicine new drugs. Beijing: China Medical Science Press; 2002. Chen JX, Zhao HH, Wang W. Investigative strategy for research on biological basis of traditional Chinese medicine syndrome: Feature selection-based data mining methods. Zhong Xi Yi Jie He Xue Bao 2010;8:747-9. Huang ZX, Tian HY, Hu ZF, Zhou YB, Zhao J, Yao KT, et al. GenCLiP: A software program for clustering gene lists by literature profiling and constructing gene co-occurrence networks related to custom keywords. BMC Bioinformatics 2008;9:308. Xu F, Gao F. Liuwei Dihuang pill cures postmenopausal osteoporosis with kidney-Yin deficiency: Potential therapeutic targets identified based on gene expression profiling. Medicine (Baltimore) 2018;97:e11659. Wang JH, Zhao LF, Lin P, Su XR, Chen SJ, Huang LQ, et al. GenCLiP 2.0: A web server for functional clustering of genes and construction of molecular networks based on free terms. Bioinformatics 2014;30:2534-6. Zhu WH, Li J, Wu BY. Using of GenCLip software in searching AS differentially expressed genes (DEGs). Mol Med Rep 2018;17:3667-73. Liu J, Jing L, Tu XL. Using of GenCLip software in searching AS the pivotal genes in the module. BMC Cardiovasc Disord 2016;16:54. Liu QL, Zhang RQ, Wang X, Wang PL, Ren XM, Sun N, et al. Using of GenCLip software in searching AS the key genes and biological pathways of prostate epithelial cell response after low dose cadmium exposure. Int J Clin Exp Med 2018;11:1669-78. Janky R, Verfaillie A, Imrichová H, Van de Sande B, Standaert L, Christiaens V, et al. IRegulon: From a gene list to a gene regulatory network using large motif and track collections. PLoS Comput Biol 2014;10:e1003731. Ji L, Cai X, Zhang L, Fei L, Wang L, Su J, et al. Association between polymorphisms in the renin-angiotensin-aldosterone system genes and essential hypertension in the Han Chinese population. PLoS One 2013;8:e72701.